Our mission is to become the leading provider of residential and commercial quality window cleaning services in the metro Atlanta area and North Georgia Counties. Image is everything. Sparkling windows create a positive first impression of your business, providing an inviting, fresh atmosphere that will please customers. Sparkle Plus Window Washing Service is a new window cleaning company established with the purpose of providing professional and courteous service to our clients. We offer a variety of affordable services for your business. We take great pride in caring for your facilities, which is why all work is performed by our own experience professionals. We believe that our commitment to providing quality and consistency every time we service our customers will separate us from the competition . 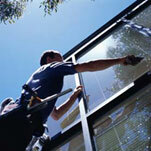 Call Sparkle Plus Window Cleaning now to handle your commercial window cleaning needs. We specialize in interior and exterior washing on store fronts, retail locations, mall locations, car dealerships, restaurants, banks, gas stations, and low-rise buildings. We also offer pressure washing for all of the above mentioned properties. washer with a bucket and a squeegee.